If you’re looking for the best bento box for toddlers, there are a few extra considerations to take into account. First of all, you want a product that’s more durable and can stand to take a few tumbles if it slips out of their little hands. Second, it’s important that the box is easy to open and close, otherwise you might find yourself cleaning up spilled lunches. The Bentgo Kids Children's Lunch Box meets all these criteria, making it an ideal lunch box for children age 3 to 7. The BPA-free plastic bento box has five compartments and can safely be used in the microwave and dishwasher. It boasts a tight seal to keep the various sections from leaking, and you open and shut the box with two secure, kid-friendly latches. As an added bonus, the edges of the box are lined with rubber to minimize impact in case of drops, making it perfect for young children. Reviewers agree this is one of the best bento boxes for younger children, as it’s durable and easy to open. Many note the compartments are the perfect portion size for toddlers and that the box really is leak-proof. And just because it is made for younger children it doesn't mean big kids and adults can't use it as well. Want to prep your kids’ snacks for the week in advance? Then you need a product like these Bento Lunch Box Meal Prep Containers, which are the perfect make-ahead snack containers for busy weeks. What’s great about these plastic bento-style containers is that you get seven in each set, all for an incredibly affordable price. The BPA-free plastic boxes each have three compartments—one big and two smaller — and come with colorful snap-on lids. They can be put in the microwave, freezer and dishwasher, adding to their convenience. These bento boxes are ideal if you want to create grab-and-go snack sets for your whole family or even meal prep for yourself. Users write that the Bento Lunch Box Meal Prep Containers are the perfect size for kids’ lunches and are high-quality. Several note that the price point on these containers is great, but the one downside is that the lids aren’t leak-proof or especially sturdy. If you’re not keen on plastic containers due to safety or longevity concerns, you may want to look into glass bento boxes for kids. While glass containers are free from any potentially harmful chemicals and will likely last longer than their plastic counterparts, the main concern here is that glass can be dangerous if broken, and they can be pretty heavy for your children to carry in their already overstuffed backpack. Products like the Glass Meal Prep Containers are best for older children and teenagers. These three-compartment bento boxes can go in the microwave, oven, freezer, and dishwasher, and they’re made of non-toxic, stain-proof glass. You get three boxes with this set, and each comes with a BPA-free snap-on lid that has silicone gaskets to keep food fresh and prevent leaks. According to reviewers, these glass bento boxes are a great size for lunches and are incredibly sturdy. However, it’s worth noting that they’re not completely leak-proof, so you’ll want to avoid putting any watery foods in them. For a kid-friendly bento box that’s free from harmful chemicals like BPA, you can’t go wrong with the YUMBOX Original. This leakproof bento box is designed especially for kids, and careful attention was given to every detail, from the cute colors and illustrations to the easy-open latch. The YUMBOX, which is made for toddlers and young children, is definitely more expensive than many other options, but it makes up for cost with great functionality. There are six unique containers in the BPA-free lunch box, each of which is labeled with a food group to help kids learn about nutrition and help parents figure out what to pack. You can pack foods like applesauce without worry thanks to the leak-proof silicone seal, and the inner shell is dishwasher safe. This box also has a little dip container to fill with stuff like hummus or salad dressing. This kids’ bento box is durable and its compartments are perfect for various snacks, according to reviewers. Most agree that the high-quality design is worth the higher price tag, but a few do note that you may want to hand-wash the box to increase its longevity. 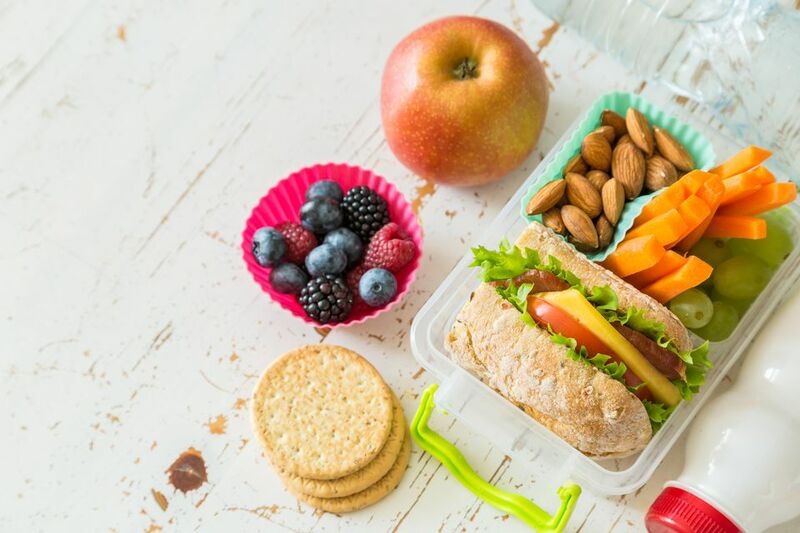 While not a traditional Bento box, these cubes help caregivers pack a complete lunch with all the snacks their kids crave — plus kids will get a kick out of opening all of the containers to see what is on the menu for the day. This set comes with a square box that will fit a sandwich and then nestled on top of that is an ice pack to keep everything cool. On top, you'll get two side containers that can hold fruit, veggies or other snacks. All of the containers snap together to take up minimal space. And they're BPA-free. Besides a sandwich kit, you can get a flat kit lunch bag kit that can slide into your kid's lunch bag or backpack seamlessly and is better suited for leftover type lunches. Does your kid like to bring salads for lunch? This leakproof container from OXO helps keeps wet and dry ingredients separate and has a handy cup that has a tightly screwing lid for dressings. What we love about this is it nestles all in together tightly so they can transport it to school easily. The lid is clear and made out of Tritan which is BPA-free and won't get discolored after washings. And after a busy day, you'll be happy to know this can be cleaned in the dishwasher. If your kid is picky about their gear they're sure to become an instant fan of these brightly colored bento boxes. Made of a BPA- and phthalate-free durable plastic your kids can choose from seven different color options including gold, navy or lavender. These boxes have five compartments to house all their lunchtime favorites like apples, cheese crackers and more. Plus, the square sizes make them easy to store in their lunch box so the contents can stay cool throughout the day.